for goodness sakes DO NOT SMASH UP COT’s!! The pieces each generate into another crown of thorns. A shot of formaldehyde usually does the trick. 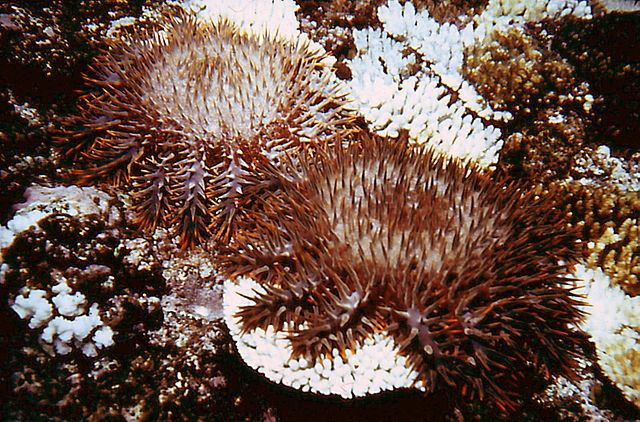 The real enemy of the Great Barrier Reef – the crown of thorns. What will happen to the poison, when the starfish is dead? Does it break down quickly or remain intact when scavengers do their stuff? Back when I was at school a long time ago, CoTs were THE threat and explanation that accompanied the pictures of dead stretches of reef. Run-off of excess farming nutrients from nearby land is part of the problem, on the GBR and elsewhere. Whenever the environmentalists come up with some scheme to save the planet, it’s usually just a matter of time before the unintended consequences raise their head. So CoT’s are not natural and need to be controlled? I just wish we would stop interfering with nature.